When it comes to Samsung Android phones, firmware update files and their exact names is very important. The firmware build number for Samsung devices is categorized into two sections, namely, PDA and CSC. The PDA consists of the update build number with Android system changes and the CSC consists of country specific changes. So all the global changes to the core TouchWiz or Samsung Experience 8.1 is contained within the PDA number. Whereas, the CSC is more of a country or network carrier specific update log for features like wallpapers, wifi calling, VoLTE, sounds etc. You don’t have to worry about CSC if you are simply downloading OTA updates officially from Samsung. However, for advanced users who like to root their Samsung device via latest TWRP recovery, may need to restore the device to complete stock at some point in order to update their device manually. Like to a newer version of Android 7.1.1 Nougat. For this, you will need the full stock firmware and flash it using the latest Odin tool (specifically designed for Samsung phones). So in order to download the exact firmware file for your device, you need to know the CSC version as well. CSC stands for Country Specific Code. It is unique for each country or region or network carrier. Here, we have created a list of all the CSC or product code along with the country or carrier it belongs to. We have basically categorized the Multi-CSC into 4 parts. The first belongs to various telecom carriers in the United Stated like Sprint, AT&T, T-Mobile, Verizon, and more. Second and third consists of similar carriers in Canada and the Vodafone. Lastly, we have listed the global or international variants. In order to find the exact CSC for your service from the below list, do a search of the country or carrier it belongs to. On your keyboard hold Ctrl + F keys and type the country name. It is a long list. 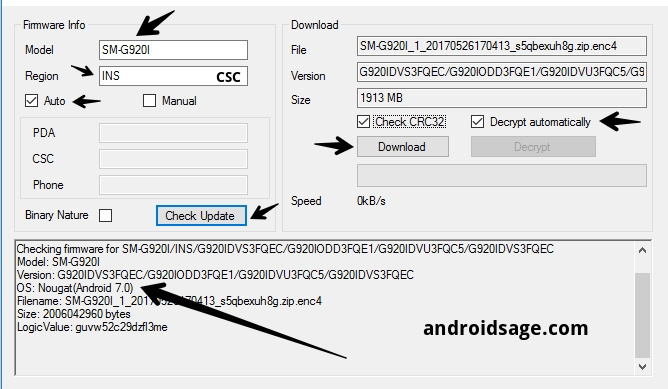 How to use PDA/CSC to download Samsung firmware update file? As we explained CSC Selection is a product code for the Samsung Android phones. It will help you download the exact stock firmware file for your device. SamFirm will help you download the same directly from Samsung Servers. Take a look at the image below on how to do it. You will need 2 things, the Model number for your Samsung device which can be found in Settings > About Phone > Software Information. Once you have downloaded the latest firmware file, see how to install it via Odin and restore it to stock. So am I able to downgrade from Samsung Experience version 9.0 to 8.5 using Odin? Before and after the update, I was using Oreo. SE 9.0 messed up a bunch of things on my phone and took away some highly used functions that 8.5 had. So far I haven’t found any method to downgrading the samsung experience version as every downgrade post is about going from Oreo to Nougat, etc. Hi, I have s7 edge from Vodafone(South Africa). It has multiple CSC codes but XFV is the only active. Can I install Vodafone (UK) Oreo Update, retaining my Home_CSC? Is this safe? Please help… Thank you. So what’s code for usa?